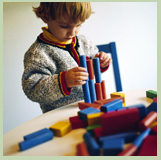 CNCC is committed to providing your child with a developmentally sound program that is consistently of the highest quality. 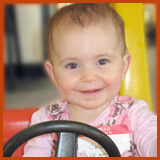 Our Center is Accredited by the National Academy of Early Childhood Programs. Parents are encouraged to participate in all facets of our Center from daily communication with your child's caregiver, to serving on our board of Directors. 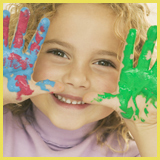 We offer a safe, happy environment for your children to learn and grow. We have large play areas, both inside and out. We are open Monday through Friday, from 6:30 am - 6:00 pm. We supply breakfast, lunch and an afternoon snack, and have a contract with the Child Care and Adult Food Program for the nutritious meals we serve. The order of admission to our Center is first-come-first-served, modified according to the needs of the program. Parents whose children are already enrolled have priority for siblings. Prospective enrollees can call to schedule a tour of our facility. Tours are by appointment only, and are necessary before enrollment is considered. Both of our infant and toddler daughters are excited to see their teachers when they see them in the morning. This puts us at ease and lets us know that they are happy and well cared for. The diaper & wipe service at CNCC is very convenient. It’s one less thing to worry about packing on a hectic morning.